I haven’t done a product review in a long time! I just noticed that. Aside from the video games, I think the last one was for macaroni and cheese, so I think I owe you guys! I went back to my lovely store of Binny’s. I love that store. If you are looking for anything, wine, beer, spirits, and anything exotic, they will have it. If not, they will direct you to it. A while back, I would say two weeks ago, I saw a crown royal commercial while I was cleaning the house. It was crown royal apple. The mixologist in me got giddy and curious. If I buy it, what can I mix it with? Well look no further! I bought it last night, and I must say, I found my man drink to hang out with the guys without thinking ‘this taste like earwax’ or ‘this really burns’. 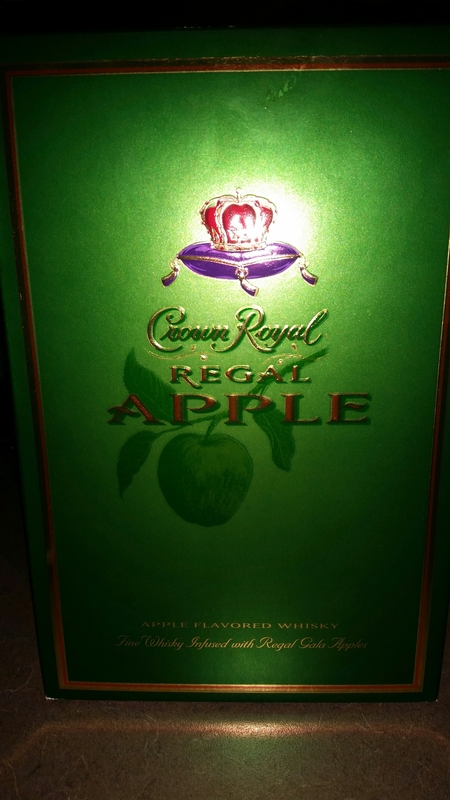 I have crown royal maple, and the apple was just like the maple. Smooth yet strong. I was a little scared of the apple mixed in, because not every liquor goes with every fruit. Well, this one surprised me. It was mixed in well, and you still were able to taste the natural flavors that crown royal had to offer. Also a bonus that it was on sale. To know at it’s worst, this bottle could cost you $35, but I caught a sale(thank you binny’s), and got this for $17. Half off! You guys know I love sales! I haven’t thought of any recipes yet, but may work on that tonight to have for later bartending 101 blogs. In any event, I had dinner, and poured this over ice, and enjoyed the taste. I had mine a little bruised(let the ice melt), because I’m still a girl! My rating: 8.5 crowns out of 10. I’m personally not a straight crown royal drink kind of gal, but I see this bottle having a lot of potential. I would give this a 10 crowns, if I knew this was a permanent flavor. I don’t have much information on that, but when I find out, I will pass along that information to you guys! In any event, if you have a older gentleman that likes crown royal, this is a great holiday gift. If you want to try something new, go out and get it. It will not disappoint!